September Fashion Ideas For Men – Lo and behold! 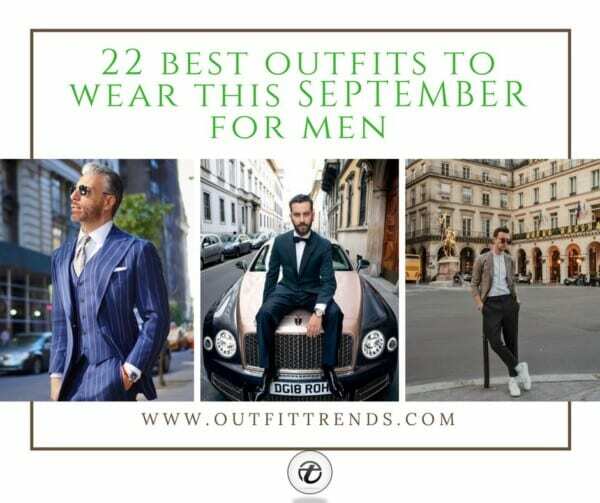 Summer is almost ending and as you desperately anticipate a season full of fun, festivities, weddings, beach parties and not-so-anticipated college and work meetings, it is high time you load your wardrobe with some of September’s biggest fashion trends for men. So go ahead and invest in some versatile pieces of clothing this month and play around with your looks. The month of September is the perfect time to stay cool and comfortable in some laid-back clothing. This is that time of the year when fall is approaching and the weather allows you to pull off a tank top during the day or perhaps a jacket at night. For every occasion, you have lots of options to choose from and if you’re someone who just can’t find the right pick, read on and get ready to head out in style as we have some of the best outfit ideas for you to take inspiration from this fall! Choose the right material so as to not feel excessively warm or cold – cotton and linen are good options for days when it’s not too cold. Denim will be your best friends this season. Invest in a good blazer and overcoat as you prep for the winter season. As the days get colder, you will need to layer up your outfits and that too, in style. When you have a choice, always go for fall colors! shades of brown, red, purple, green, mustard, yellow and blue look great in September. For footwear – this is the perfect time to bring out your boots. Other than that, trainers and loafers are good options as they are great for both casual and formal looks. This is the time to experiment with accessories, so go get yourselves some scarves, mufflers and beanies. To have you primed and ready for every occasion this month has to throw at you, we have compiled 22 best outfits for all you men out there. Have a look! A white t-shirt has to be the most versatile piece of clothing ever and there is absolutely no way you don’t own one! You can style it in numerous ways depending on the weather. On relatively hot days, you can wear it on its own with classic blue jeans. Alternatively, you can try it with different combinations such as with a bomber jacket, blazer or overcoat. Here are Men White Shirt Outfits. Been struggling to put together a casual look for this month? 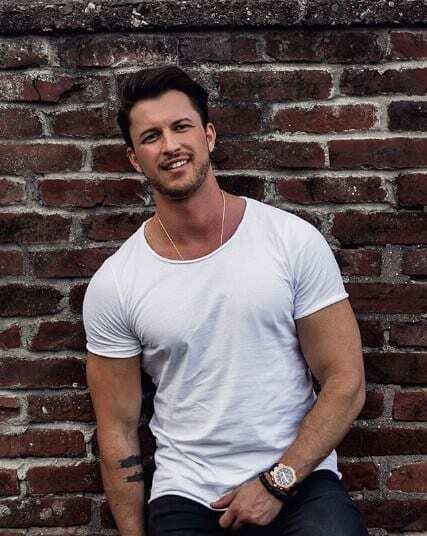 Whether you are heading out for a casual hangout or daily chores, stay stylish wherever you go in a laid-back look with your favorite graphic tee and ripped jeans. You can also layer it up with a trendy bomber jacket. Stand out with a cool pair of converse shoes. With new seasons come new trends but fall/winter is that time of the year when some clothing items are constant and an absolute must have in your wardrobe. It’s good to invest in some timeless pieces of clothing such as a warm, stylish overcoat, blazer, hoodie, sweater, windbreaker, beanie, and scarf. Make sure you are not missing out on any of these! Stripes work great in every month, every weather! You can get your hands on a wide variety of striped shirts – thick stripes, thin stripes, vertical stripes, horizontal stripes and lots more! For this month, we would recommend you to get out of the usual black and white thin stripes and go for something with color, such as this blue and white vertically striped shirt with white pants and sneakers. Also have a look at these 26 Ways to Wear a Scarf for Men. It’s the month of festivities! Here’s an example of an outfit that you can wear to dinners, parties or any event with a semi formal dress code. A pair of cropped black dress pants will go a long way and goes with almost any shirt such as this white one with a grey blazer. You can also add a belt for a stylish look. Here’s a classic wedding look that you can not possibly go wrong with (even if you are the groom!). A bold black suit with a tuxedo and white shirt is all you need to make every head turn your way. Go for formal black shoes, preferably with a shiny finish to complete your look. If you want to look young, fresh and trendy, go for a flannel shirt with rolled sleeves and wear it over a simple t-shirt of your choice. Pair up the combination with ripped jeans or denim jeans and lastly, your favorite pair of trainers or sneakers to achieve that in-trend street style look. Step up your outfit game this fall. It’s time to make a bold yet sophisticated statement by mixing and matching different prints and patterns. Here’s one such stylish look with a patterned button-down silk shirt worn with white pants to balance out the look. This outfit can be worn to any house party or fancy event. Here are 25 Ways to Wear Guys Floral Shirts. Boys, keep your usual boring shirts aside and start experimenting with prints this fall. If you are looking for some inspiration, here is one look with pants and printed shirt in the perfect shade of gray. Also check out this super stylish pair of loafers which is totally uplifting the outfit. Another look you can try this fall is an outfit with a corduroy jacket, such as this olive green one which is the perfect fall shade. This material is a great choice for this month that will make sure you’re neither feeling too cold nor hot. You can wear it over plain black skinny pants and t-shirt or perhaps a turtleneck. It’s time to hop on to the trend of track bottoms and finally have all the cozy feels you always wanted! This piece of clothing is not only restricted to sports wear, it is now almost as common as jeans. You can wear the baggy style for a street look or go for slimmer ones for an athleisure look. If you’re wearing one in a funky color, go for a neutral shirt and vice versa. Keep things simple, minimalistic and classy for day wear with a tucked in white shirt and white pants. Add an extra oomph to your outfit with a cool belt and scarf tied around your neck for a chic look. Looking for the perfect outfit that screams class? Here is one. A slim fit striped shirt with rolled sleeves and half tucked in over ripped skinny jeans. You might want to go sock less with your loafers to stay comfortable. Not only does this outfit look stylish, it is also easily carried by almost everyone. Look your best in an outfit with a modern and fashionable blazer, worn over a tucked in shirt and pants. It is best to avoid dress pants if you are going to a place where a strict smart casual dress code is being followed. You can also carry a men’s handbag to step up your style game, whilst utilizing its functionality. Here are 18 Tips What to Wear for Business Casual. Denim is one of the safest and practical pieces of clothing for college in September, whether it is denim jeans or a denim jacket. You can style the latter with a simple black, white or grey t-shirt and denim jeans to go with it. Make sure you don’t overdo it. Put your favorite sunglasses on and rock that easy breezy look this September like never before! It’s time to embrace September’s crisp days and cold nights with some comfortable clothing that you can stay cozy and comfortable in and what can be better than a lightweight yet warm sweater. Go for a plain sweater in one of autumn’s in trendy colors such as shades of brown, mustard, red, olive green etc or go for a designer one such as this Gucci sweater that incorporates most of the fall colors! Here are 17 Ways to Wear Sweaters Fashionably. Whether you are going to a meeting, event, wedding or a formal dinner, this outfit will give you the ultimate sophistication you are looking for. A classic black suit and white shirt never has and probably never will go out of fashion and there is no reason why you shouldn’t wear it this month. If you want to go for a further formal attire, you can add a tie to the outfit. While they are easy to wear and a great addition to your wardrobe accessories, it can be tricky to pull off an outfit with suspenders. If you are a first-timer, we’d advise you to go for a classic old-school look consisting of a white shirt with dress pants. You can also add a navy blue tie to give it a typical schoolboy look. Look young, look festive with some of September’s biggest fashion trends! If you are tired of the same old plain clothing, you should definitely put your boring wardrobe aside and get creative. One way to do so will be to go for some graphic tees or jackets with text and embroidery to make a bold statement or just for fun. This month, start experimenting with accessories. A cool cap or hat will come to great use and will also make you look super stylish. Make sure to always have your watch game on point and if you are into rings and chains, we would totally encourage you to go for it! When going for a usual day at work or a business meeting, make sure you look impressive and unique. One way to do so is to get yourself a pinstriped three piece suit in a unique color such as this shade of blue – which will work great in this month of fall and also throughout the year. Balance out the stripes with a tie that does not have stripes on it. A simple or dotted one is a good option. With all these tips and ideas in mind, you will be all set to impress everyone around you this month! Just remember to stay comfortable in whatever you choose and carry it with confidence. We hope that you liked this article. Don’t forget to leave your feedback in the comments. Have a happy September fellas!